Freaks Killing Freaks | Thoughts of a Calabarboy. Freaks Killing Freaks – Thoughts of a Calabarboy. When the rich oppress or kill the poor it is understandable because there are probably huge differences in interest. When the rich kill the rich we may say that there was a clash of interest so one had to bow to the other. But when the poor kill the poor, how do we understand that? Are there hidden violent tendecies provoked by hunger or does poverty reduce men to brutal forces of darkness. If they killed and ate the bodies, I may say that they needed food. But when it comes to the point that poor people, with no education and forseeable progress drop their food bowls and pick up arms to destroy one another all in the name of religion, then I have to consider insanity. What’s going on in Northern Nigeria right now is absolutely disheartening. When I saw images of the slaughter I almost jumped out of my chair. How can people live like this, waking up one morning and determining that you will kill someone in the name of God. What devilish motivation inspires you to think that the same God who you believe will create a person will mandate you to destroy that person. This is the grand deception going on in that part of the country, fuel by Muslim extremist and religious freaks. I do not expect the government to continue overlooking the threat of such extremism brooding all over that part of the country. There should be a deliberate action by the authorities to ban every form of extreme religious groups and monitor, by intelligence, all such underground operations because they are so many up in the North. But while I am concerned about the North, what about the Barbarians in the South who claim they are fighting a just cause by terrorizing innocent lives? No matter how just the cause, taking lives is not justifiable. When it is reduced to that, then I support a massive attack on such groups to end their reign on terror. Infact, I think the terrorists of the South should go up and confront the terrorist of the North. That way it will be freaks killing freaks. why should He? ?…..did He cause it? ?….my fellow nigerian…do u want ur country to be like iraq? afgahnistan? or israel? where u wake not knowing if u re gonna die that day from a suicide bomber? ?…the earlier we take responsibility the better…..
Emma, I guess Tomi is just saying that as a last resort, since our leaders have not idea how to deal with this problem. It’s really getting very troubling. And yet we are claiming to re-brand a nation that is on fire. Who is deceiving who? 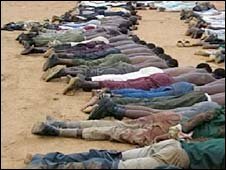 lets be grateful that this didn’t happen when obasanjo was president, we all know what will happen……the fanatics would claim its a christian vs Muslim war…..trust me the Muslims would not hesitate to act…..while Christians will die like fowl waiting for God….God is not going to interfere(in the words of a man of God, ”He gave us a brain so that He can rest”)….its time to act…..lets not repeat what happened in Nazi Germany….when good men kept quiet and watched while evil prevailed….this is a dangerous trend oh!! In fact, this is my issue Emma, and you noted it well. It is a dangerous trend and what philosophers call a slippery slope. I published a piece about this some months ago called “NIGER-DELTA: A CIVIL WAR IN THE MAKING?” and I refer you to it. You can search through my articles here. I couldn’t agree with Emmanuel more, it’s about time we all learn to leave God out of situations we bring upon ourselves. I believe that religion of every kind has caused so much aggravation in the world today. Nigerians are just too indoctrinated in religion that they find it difficult to think for themselves. They allow themselves to be brainwashed by unscrupulous characters masquerading as “men of God” and take whatever is said by such men as the word of God. Education (the kind that is separated from religion) is the key to the deliverance of Nigeria. But would our leaders allow for such? I do not think so. Religion is not just Nigeria’s problem, but the world’s problem. I believe there is God,. but certainly not the ones these men tout about and brainwash people into extremisms that hold as its object fellow humans. oh, and Reggie, religion is not our problem…it is just one of our many excuses not to do anything.